Gregory Ratoff, who played the Count in The Sun Also Rises had previously directed Tyrone in 1939's Rose of Washington Square and Day-Time Wife. He also wrote and appeared in 1937's Cafe Metropole. 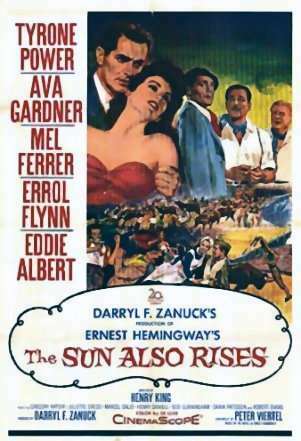 The Sun Also Rises is said to be Errol Flynn's finest performance in the latter part of his career. Many people incorrectly state that Errol Flynn won an Oscar for the performance. He wasn't even nominated for his supporting role in the movie, though his critical reviews were excellent. Darryl Zanuck, now independent producer for his own company called DFZ Productions, produced the film, which Fox released. Zanuck felt that Tyrone was perfect for the role of Jake. To Zanuck Tyrone was symbolic of Jake Barnes, "the truest, the handsomest, the best of the lot." This was the eleventh teaming of Tyrone with director, Henry King. Sadly, it was their last. There is a terrific audio interview with Mr. King on the special features of The Sun Also Rises DVD that was released in March 2007. The movie was filmed in Biarritz, Paris, Madrid, Pamplona and Mexico City. At that point in time, The Sun Also Rises was the highest budgeted movie ever filmed by 20th Century Fox. New York Times: "Darryl F. Zanuck has assembled a glitteringly spacious and beautiful background canvas ... the visual magnificence in CinemaScope and color frames a picturesque cast .. director Henry King has staged a personalized, handsome, big 'show' from Peter Viertel's admirably faithful script." Britain's Monthly Film Bulletin: "What the film lacks throughout is a really strong focal point which the necessarily passive role of Jake -- although it is solidly and sympathetically played by Tyrone Power -- cannot really provide." Time: "The Sun Also Rises is real Hemingway almost all the way... It shines more brilliantly than anything of Hemingway's ever filmed before. Jake Barnes is sensitively played by Tyrone Power."